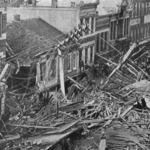 The (first) Johnstown Flood occurred in Johnstown Pennsylvania in 1889. It was the worse tragedy in American history before September 11, 2001, in terms of lives lost. This poem is a found poem of sorts, mixing actual accounts by survivors and witnesses with the creative process. It is a poem in long form, 8 pages of writing. The poem was originally published by Zouch Magazine, and can be found using the link below.